Have you ever been driving late at night down a dark road and it seems there is no civilization for miles? You think to yourself how this would be a great scenario for a horror movie, yet all the while hope you’re not part of the horror. There is a road known as one of the scariest roads in America. Clinton road in West Milford New Jersey has quite a reputation from as early as 1905. 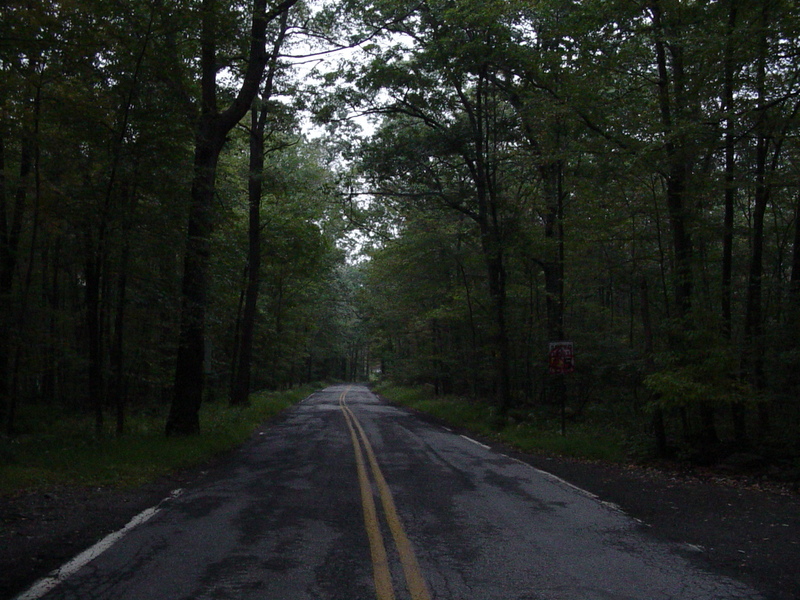 Clinton road is a simple two lane road, surrounded by woodland with many ghost stories. One of the most famous stories is near the bridge. There is the tale of a young boy with some conflicting details; some tell of the boy drowning, others say that he was hit by a car going down the road. If you drop a coin into the water it is believed the coin will be tossed back up to you. Another legend states if you leave the coin in the center of the yellow line in the road the same will happen. A more terrifying twist on the tale is if you lean to look over the bridge, the boy may push you in an attempt to get you off of the road and away from oncoming cars. There have been numerous accounts of strange activity, murders, and robbery. People have claimed to see bonfires in the woods surrounding the road, stories of Satanists performing rituals and even KKK gatherings. Back in 1983 a body was discovered in the woods by a bicyclist. This was one of many victims of Richard Kuklinski also known as the “Iceman”. Kuklinski was given the nickname due to freezing the bodies of his victims’ to make it seem as if they died at a later time than they actually did. When an autopsy was performed on the victim found near Clinton Road they discovered ice crystals near the blood vessels in his heart. If ghost children, murderers, and cults aren’t enough there have been stories of strange creatures being spotted on this road. In 1976 a Jungle Habitat attraction closed and it was believed a lot of the animals escaped and cross bred. Bizarre monkey-like creatures, large rabbits and even “hell hounds” are reported to dart across the road. What would stories of a scary road be without reports of a ghost car? One tale tells of a phantom Camaro with a ghostly female driver who died when she crashed the car in 1988. There is a theory that any mention of these stories at night will trigger a manifestation, possibly it just triggers the imagination, either way many take the dare to drive this road at night. For several miles there is nothing but darkness and the sight of your own headlights. Many do this in hopes of triggering another famous legend of Clinton Road. Imagine coming up to the large curve known as “Dead Man’s Curve”. There is now a railing put up along the side because many have driven off of this curve and died. Yet this does not seem to help, why? Well, did I mention the Ghost Truck? Here you are taking this long dark drive when suddenly headlights appear in your rear view mirror. There seems to be a driver behind you, they seem to be in a hurry. The truck tailgates, backs off then rushes the back of your car again. They are driving erratically, swerving, and yet they never go around you. This truck seems to almost want to make you veer off this road. You continue to speed up but the driver behind you will not back off and is getting really aggressive, you can even hear their engine revving. Finally you reach the light to the main highway, you feel you have reached civilization again, suddenly you notice the headlights that were relentlessly following you have disappeared, vanished like there was never another car behind you at all. Actually there more than likely wasn’t another car; you have just encountered the infamous Ghost Truck. Seen as either a white or red truck, this has been one of the most common experiences of this spooky road. Maybe it is the way our mind takes in the sight of a long, dark, seemingly endless road. As humans we need to see light, a goal to move towards. When that seems it isn’t within reach we tend to get a feeling of dread and discomfort. Knowing all the legends can fuel the imagination but tell me, would you drive down Clinton Road?